What Is Middle Class, Anyway? Here's why many middle-income families feel that they're falling behind. One of the surprising challenges in writing my ongoing “Restless Project” series has been defining whom I’m writing about. I’ve featured a number of families who are struggling despite having what seems like solid incomes. Many of those families have subsequently faced withering criticism, with folks convinced they don’t need to make more money, just spend less. While there’s some truth to that, I think the bigger truth is that Americans are fundamentally and chronically underpaid. That leads to a rat race that a shrinking minority can win, and with a growing majority driving themselves crazy. As we all debate this, there’s a real problem in defining our terms. What is middle class? What is a decent income? I’ve argued that in many American urban centers, $100,000 in spending power is the base line, but, of course, plenty of folks get by on half or even one-quarter of that. Geography matters, housing costs matter, job availability matters, phase of life matters. America is so diverse that it’s easy to think this discussion is darn near impossible. Middle-income families are families whose size-adjusted income is between two-thirds and twice the median size-adjusted income. In other words, families of four who earn between $44,000 and $132,000 would be considered “middle income.” Single households earning between $22,000 and $66,000 are middle income. You can see more in the chart to the left. Using this technique, Pew nicely dropped families into their correct buckets. This methodology results in 46 percent of America’s families being classified as middle income in 2013. 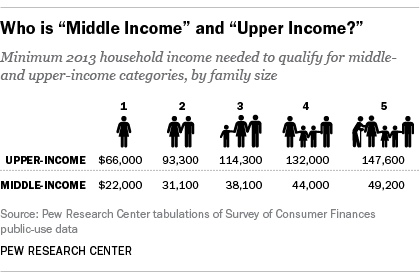 One-third of families were lower income and 21 percent were upper income, Pew says. Dropping families into groups this way certainly tells us more than saying the median household income is $53,000. Based on the email I’ve received, many of you think a family earning $100,000 couldn’t possibly be considered middle class, but there it is, smack in the middle of the data. Of course, income is only one element of lifestyle, and it may not even be the most important one.